Is Ducati Really Taking on the VMax? All this talk about Ducati debuting a muscle bike later this year has had me confused. Why would Ducati enter this market? Nevertheless, the rumors are getting stronger, and are now supported by a purported sketch of the machine that might be introduced in Milan. The referenced “testastretta 11 degree” engine would be the 1198cc unit found in the Multistrada, and the other notations on the sketch would indicate a high performance objective, including a significant lean angle, as well as ride-by-wire and traction control . . . not to mention superbike-style brakes. Will we see this beast in the Fall? The sketch is reportedly sourced from a dealer here in the United States. Remember Buell motorcycles? 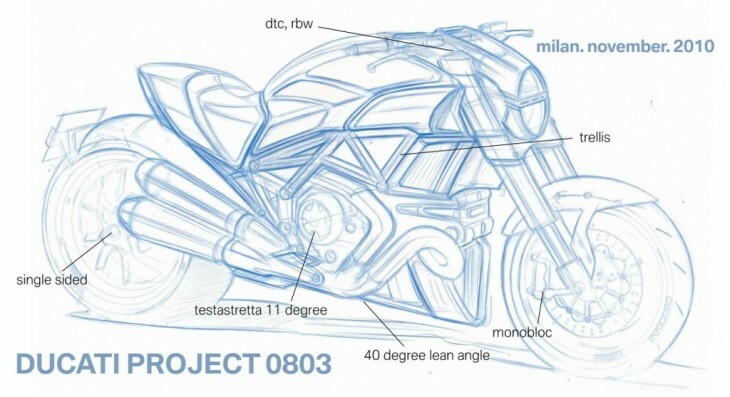 this sketch is something very close to what Erik Buell would build, and with Buell gone, well I think is fair game to “copy” his style. I am a Ducati 999 owner and a V-rod owner, and find the power delivery of both bikes at high RPMs simply awesome, however the v-rod is very civilized at around town speeds, where as the Ducati is build for speed. So I have yet to see a better bike that has the v-rod styling and power, even if harley purists hate it, but no one will debate the engine performance. I love the idea and the styling of this bike. i am a Ducati owner and no, I have never owned any type of bike except for many sport bikes and a few sport tourers. This will be a good change. I worry though about a heavy clutch and bad manors under 4,000 RPM. It’s the way Ducati’s are. No problem if your hauling arse all over the countryside but in town, this could be an issue. If I ride a sport bike I’m heading for the twisties. I would like a powerhouse with great sound and style. I just hope this great looking bike will be rideable in town or city traffic. I don’t think that Ducati try to beat VROD or VMAX in market or in performance. I think they have another aim but i can’t figure it out. Why would Ducati build this bike? Why would they build the original Monster? Why would they build the SST sporttourer? Why would they build the Multistrada? There have been these questions since Ducati decided to start thinking outside the sportbike box. Ducati riders don’t think like Harley riders. They aren’t snobs when their company decides to venture outside of their norm so this venture can’t be compared to the experiment called the V-Rod. The VMax is a different breed of bike so there is no comparison. No, I do not own a ducati but I understand their business model somewhat. 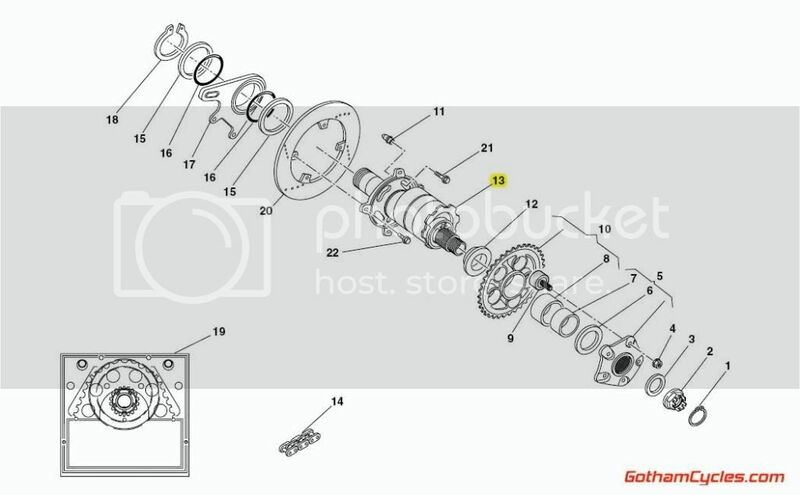 Ducati is a small volume manufacturer. They don’t have to outsell everyone else, they just have to sell everybike they build which they do. Keep it light and it will sell. Ducati can obviously get the HP needed, but a 475 lbs. bike with serious lean angle and 155 ponies or so would be huge fun. Although I love seeing new models hit the market, this bike will never be a “big” seller. Just like the new VMax isn’t. It’s very difficult for any of us to understand why anyone would spend money on a VRod when the new VMax is available, but the numbers are staggering. Even with Harley’s horrible sales numbers, the VRod outsells the VMax by far. The problem with Ducati making a bike like this is that Ducati riders are just as loyal as Harley riders, but Ducati riders don’t ride cruisers. They are entering the market with the wrong badge. With all that said, I am referring to the US market which is mainly aesthetic and brand focused. Overseas this bike could be a hit. The V-Rod has been a good seller in other markets outside of the US…. but here in Japan the sales of BUELLS were better than the V-rod even it seems to my eyeballs… or at least the BUELL riders are actually out riding… perhaps all the rods are just parked… That said I ride a StreetRod here most everyday… like it a lot… and would LOVE it if it was about 100 pounds lighter and had even more power… and that is something I have faith in Ducati to accomplish… HD never seemed to understand performance unless it was in a straight line… and even then… any UJM would smoke a V-Rod. I’ll buy electric bike the like from previous post. Tired of that noise near my home. Trolleys are much better and much cleverer. Not to mention the exauhst. Looks like a Harley V-Rod. I ride a HD right now & if they made this bike I would buy it in a heart beat. No questions asked. I’ve always love Duc’s but they don’t fit a guy over 6ft! I love this site. The ads are perfect as is. But somehow, the pictured bike may pull of the trick of combining naked, good styling, and great performance. Overall I can’t wait to see it if it goes beyond the proverbial “vapor ware”. Put togheter 2 ” 1198 ” engines, make a 2.4L V-4 and call it Apollo and a day. I don’t care for ” CAT ON A RUG ” Kind of Handling on this Bike Category. Just give it BALLS, lots of it (200hp+). VMAX – ROCKET III Who ? Call me a Poser and a “Ducati Infidel” but thats what i would like to see done here.lol. No… we don’t ride specs sheets, thats a fact but so is that people look at “numbers” and get “sway” towards said product showing said specs sheet hanging from it. And all bike manufactures are out to make money pretty much any way they can…….enough said. Yoou Ask Why they would build it.Why not.Its not just the v-max market,its the Suzuki M109R market,the yamaha warrior market,Any street muscle brusier wanna be bike.Its huge with the over 40 crowd.Finally a Ducati for the north american market that hopefully will fit 6 foot bodies. Is Ducati Really Taking on the VMax? Let me offer this article title revision…. IS DUCATI TAKING ON THE V-ROD?? It does seem to have V-Rod visual cues. But the V-Rod is about 615 lb curb weight. Excess weight is one of the reasons I and many others hate cruisers (that and way too little lean angle). It would be nice if this alleged Duck comes in under 500 lb curb weight. OTOH the BMW Lo-Rider Concept bike shown circa 2008 had promise. The V-Rod is one of Harley’s most successful models outside the United States. A dismal failure it most certainly is not. I like the V-rod motor, hate the presentation…. I wouldn’t be suprised if they discontinued the V-rod once they eventually start making liquid cooled bikes in the style of the existing bikes…. I assume they axed Buell because of the aquisition of MV Agusta. Looks to me like an updated style-wise Monster. Nothing wrong with that! This is what I expected, but I just couldn’t visualize it. The axle center passes through that eccentric hub, off center. As the eccentric hub is rotated within its mount point on the swingarm, the axle is caused to move in a circular path, thereby moving further or closer to the front sprocket. So rather than loosen the axle, you loosen the clamp that prevents the eccentric hub from rotating. Looks like OCC trying to make a VROD look like a ducati theme bike. That thing’s gotta have a 64 inch wheelbase from the looks of the drawing. what a barge. I like the new Multistrada, but I don’t like having to adjust a chain every several hundred miles. I got to wondering how chain adjustment is done on the bikes with single-sided swingarm. There are several videos on the web, but none that I found really shows how this is done. One of them made it seem as though you don’t have to loosen the axle bolts. But I don’t think that can be right. The only way to adjust chain slack is by moving the sprocket forward or back, and since the center of the sprocket has to line up with the center of the wheel axle, it follows that chain adjustment always involves moving the wheel, with sprocket, forward or back on the swingarm. But in the videos, you can seen that a special spanner is being used to move the wheel, which seems odd to me, because if the axle is loose, it should be easily possible to move the wheel by hand. I guess I’ll have to take a close look the next time that I visit a dealership. I wish that the Multistrada used shaft drive. Typically, the axle is not centered nor solidly mounted to the swingarm.. It is mounted in an eccentric assembly that is usually secured via pinch bolts on the arm. You would loosen the bolt and rotate the assembly that holds the axle, which in turns moves the wheel forward or back. Once you take a look in person, it will make a lot more sense.. I find that the ads do not impair reading your site. Please keep earning money so you may continue this site. I think Ducati is trying to tap into additional segments of the market that is suffering right now and may be good timing. With the Ducati Logo brand they might be able to pull a few Harley riders off of those bikes and a few disapointed VMAX riders. If they will keep some decent handling, that great sound and not get carried away with the price, unlikely, then they might move a few units. Right now there pricing is high to get a deep penetration into the market. Harley is having the same issue and BMW and certainly Aprilia. Many of the professional type riders that currently have Harley that I know would make a change to a cool Duc possibly. Much of the clout that Harley had they have lost to some extent with that lack of market adaption. For the only reason anyone ever enters any market. They think they can make money there. An interesting concept to say the least… Out of the box for Ducati, but that maybe reason enough for them to build this..
Hope Ducati goes for it. Respectfully; this site is very advertisement intense, which makes it less of a reason to visit. The ads are what pays for it Pat. You’d have even less incentive to visit if you had to pay for a subscription. As long as they don’t do pop ups and/or force feed videos, I am all for it. Someone has to pay, either by subscriptions or by ads. Gosh, didn’t Ducati just do this with the StreetFighter? Also, even though I am a Yamaha and VMax fan, the last time I checked, the Suzuki BoostKing was faster and quicker. Ducati, please remember that the Vmax has a lot of untapped HP in it’s engine so don’t get suckered into a horse power game. I will have to say that it would be nice to have a Boulevard BadAss that doesn’t weigh as much as two normal bikes! Good luck and more power to you, Ducati. So is a GSXR-1000 compared to an 1198. You don’t ride a spec sheet. The Streetfighter is essentially a full-spec superbike without bodywork or clipons. The V-Max…..not so much. Neither will this new concept be.